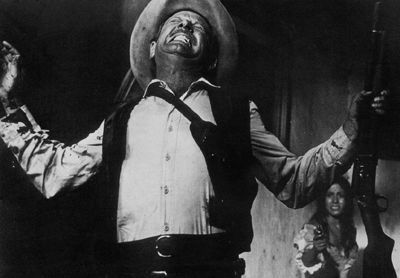 A Mexican prostitute shoots William Holden in the back in The Wild Bunch. The Wild Bunch is generally regarded as director Sam Peckinpah’s greatest achievement, this Western that is more of an anti-Western. Though many other Westerns have sided with "noble" outlaws, this film totally defies any typical definition of the genre, giving us outlaws and lawmen alike who demonstrate only casual awareness of any "Code of the West." Pike Bishop (William Holden) is an outlaw who wants one last score. Dutch Engstrom (Ernest Borgnine) is the loyal second-in-command, with Warren Oates and Ben Johnson as quarrelsome brothers Lyle and Tector Gorch. Edmond O’ Brien as Sykes is the oldest member of the crew, while Angel (Jaime Sanchez) is on his first ride with the Bunch. This is a bunch, not a gang, with only fitful loyalties or purpose. The law is no better. The railroad has pressed into service Deke Thornton (Robert Ryan), a former partner of Pike, who with the old coot Sykes are strangely the only "moral men" on either side. Following Thornton for the bounty--and whatever they can pick off dead bodies--are a bunch (not a posse) of ill-trained "peckerwoods," most notably Peckinpah standards Strother Martin and L.Q. Jones. The most famous line from the movie is bitterly spoken by Thornton: "They are men and I wish to God I was with them," he says about Pike's men (after witnessing yet again the quarrelsome, white-trash antics of his own bunch). However, it is unclear whether Pike deserves such praise. Despite Pike’s own proclamations--"Being certain is what I do"--his arrogant carelessness led to Deke’s landing in prison and his "one true love" being killed--while in both instances Pike escaped. Though he declares, "When you side with a man, you stay with a man and if you can’t do that you’re some kind of animal," he knowingly abandoned a loyal gang member (Bo Hopkins)--who later turns out to have been Sykes’ grandson. Not only is the doctrine of loyalty constantly strained in this film, but so is the Western’s usual deference to woman and children: they are not protected and they are portrayed as unworthy of protection. The film opens with children sadistically pitting ants against scorpions. The ambush of the opening robbery catches a temperance parade in the cross-fire, leaving several citizens wounded and trampled. When Angel sees the woman he idealized as the mistress of General Mapache (Emilio Fernandez), he shoots her, compromising the lives and livelihood of the Bunch. The Western has generally been interested in preserving and/or restoring order to society–which is generally associated with the domestic world of women and children. However The Wild Bunch neither seeks to improve society nor does it yearn for a "better world." Though Pike and the Torch brothers both are looking for a last score that will allow them to retire, they have no idea what kind of retirement that will be. This film has nothing but contempt for anything less than manly men--while it questions whether even the manliest of men is worthy of respect. Obviously, the historical context of the Vietnam War is an essential subtext of the film. The only fully honorable characters of the film are the Mexican villagers and resistance fighters. When the Bunch make their final stand--prompted by malaise as much as honor--it is no coincidence that they first kill the General and then his German "advisors." The epilogue of the film is strangely upbeat, as the survivors band together with the Mexican peasants, with the fallen shown in flashbacks laughing. As Sykes grins: "It ain’t what it used to be, but it will do." In a society without a moral compass, men like Thornton will choose a stand over no stand at all, generously forgiving false leaders like Pike.